BEFORE YOU EVER STRETCH YOUR NECK AGAIN, READ THIS! One of the questions that we get a lot is, "How should I stretch my neck?" Or, "Should you stretch the neck?" The answer is, "It depends." It definitely depends on the type of issue that you're having. I will tell you one thing that I see people doing a lot, that you should never do, and that is taking the neck in a certain direction and stretching throughout the entire range. If somebody taught you -- and I learned this in school, so I'm not knocking you for doing this -- but if you take the neck and you pull it into end ranges of motion in one direction or the other because your neck feels tight, then, you're probably doing yourself a disservice. There's a very complex answer of why this is. The way that I like to distill it down, and make it a little bit easier to show is that, if you have a series of chain links that interconnect each other, and then, one of those chain links in the middle is loose, and I go from one end of the chain to the other end of the chain and pull, it doesn't go to the tight lengths to stretch those. It tends to go to the weak link, which is representative of the problem spot in your neck. We understand that stretching your neck feels good, but you would probably be better at some point. Patient - "I do my neck stretches every single morning." Physical Therapist - "How long you been doing that?" Physical Therapist - "Well, wouldn't you be better at some point? Wouldn't you get to the point where you don't have to continue to do those?" It takes a lot to get people to stop that type of stretching. When they do, a lot of times just stopping the stretching will eliminate that kind of stretch reflex that occurs, and help you to improve. I do want to say, that is okay to stretch areas like the base of the skull, and underneath the bottom of the neck that tend to get tight. 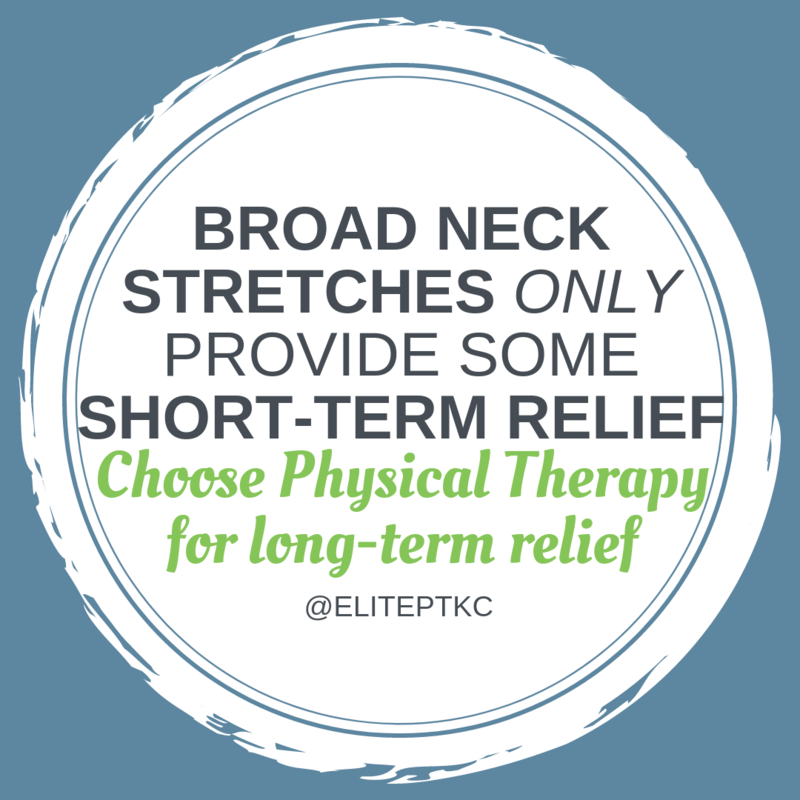 It's the mid part of the neck that we want to avoid with the stretching. One stretch that I love, is a stretch where you interlock your fingers behind the back of your neck. You place it over your neck, itself -- at the mid part of the neck. You want to sit as your do this. You're going to bring the elbows in and then, you're going to scoop up. It's a very small movement. It's not real far, or else you're going to the low back as you do that. You want to go from the elbows with your neck supported, and just scoop up. It's a very small, again, movement from there. Right underneath of where my hands are, is where you want to feel that stretch actually occurring (see video). You're really stretching the joints, more so than the muscles, themselves, which is a lot different than this broad range stretching.